The rest of this chapter will determine which one of these is right for you. First, we need to understand the difference between these three hot water systems. Did you know that there are two fundamentally different ways to generate solar energy, and, therefore, two fundamentally different types of solar panel? The two concepts both have multiple names, but from here on I’m going to call them ‘solar PV’ and ‘solar thermal’. Let’s start with solar PV panels. This is what I’ve been talking about in this book up to now, and it’s what you probably imagine whenever you think about solar panels. A solar PV panel is the name most industry professionals give to the type of solar panel that generates electricity directly from sunlight (when they’re being careful with their language). If they’re not being careful, they’ll simply call it a solar panel and assume you know what they mean. A solar thermal panel is a different beast. It is used only for heating water and installed on millions of Aussie roofs as part of a solar hot water system. Solar thermal panels heat up the water directly, using the heat of the sun. No electricity is generated. 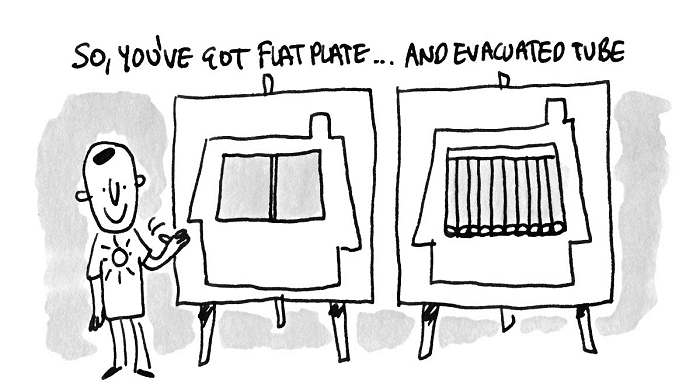 There are two types of solar thermal panel available: flat-plate and evacuated-tube collector. A flat-plate solar thermal panel looks similar to a solar PV panel, except it is about three times as thick. A more expensive evacuated-tube collector looks completely different – see Figure 3.3. Both these types of solar thermal panels are designed to take cold water in, heat it with energy from the sun and send piping hot water out. Every home in Australia needs hot water. Using fossil fuels to heat water, whether it is directly with gas or indirectly with coalfired electricity and a big kettle, is wasteful in sun-blessed Australia. An efficient and sustainable way to heat your water is to expose it to sunlight with a simple solar thermal panel and then store the solar-heated water in a well-insulated tank. This is a ‘solar thermal hot water system’. Am I simply going to recommend you get a solar thermal hot water system along with your solar PV system? No. And the reason is economics. Although solar thermal was, for decades, the cheapest form of solar water heating in Australia, the plummeting price of solar PV means that this is no longer the case. This makes it expensive. Expect to pay from $4,000 for a flat-plate system and up to $8,000 for a more efficient evacuated-tube system. The cheaper options for solar water heating, which can be just as efficient to run and just as environmentally sound, are the heat pump or diverted PV systems. A heat pump extracts heat from the air and transfers it into the water. As the heat originally came from the sun, it can be thought of as a solar heat pump. It looks like an air conditioner piped to a hot water cylinder, as in Figure 3.4. Figure 3.4 A non-integrated hot water heat pump. Figure 3.5 An integrated hot water heat pump and cylinder. If you live outside Queensland or the tropics then, give or take $100 a year in electricity costs, modern heat pumps are about as efficient as a flat-plate solar thermal hot water system but much cheaper to buy. You can claim the solar rebate on a heat pump, which reduces its cost, starting at $2,000 installed (compared with $4,000 to $8,000 for a solar thermal hot water system). In Victoria, if you’re replacing a resistive hot water heater (i.e. the big kettle) with a heat pump, you can get a heat pump for under $1,000 because the Victorian government applies a second rebate, known as a Victorian Energy Efficiency Certificate (VEEC). In Queensland and the tropics, a conventional solar thermal hot water system will be more efficient than a heat pump – so Queensland folks should bear that in mind. A good heat pump is as quiet as a good-quality air conditioner and will work well even in freezing temperatures, albeit with a reduced efficiency. If you don’t mind the hum and are happy with paying for regular maintenance, a heat pump is a good choice. A heat pump is also a good choice if you have a generous feed-in tariff, as its efficiency leaves more electricity available for export. 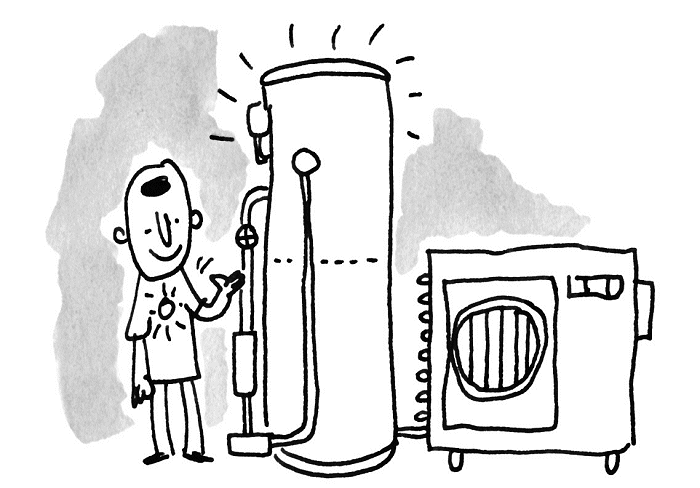 If you do buy a heat pump, it’s important to try to run it off solar PV as much as possible. That means two things: running it in the day (when it is more efficient anyway, due to higher outside temperatures) and having enough PV to power it over and above your other appliances. If you get a heat pump, consider going for a large (6 kW or more) PV system so that you get enough solar electricity between 11am and 3pm to run the heat pump even in winter. No matter where you live in Australia, whether it’s the tropics or Tassie, there is a potentially even cheaper option for heating water with the sun, provided you buy it at the same time as your new solar PV system. This is the cheapest (in terms of upfront cost), most reliable and lowest-maintenance system for heating hot water from the sun. If you have the room on your roof and are concerned about the noise, cost or maintenance of a heat pump, it is a good alternative. A diverted PV system uses an intelligent control box to divert ‘spare’ solar electricity from your existing solar PV panels (the ones you are about to buy) to heat your water using a cheap-as-chips conventional hot water cylinder. This spare electricity would otherwise be exported to the grid, and, as you learned in Step 1, self-consuming solar electricity is the most valuable way to use it. The beauty of a diverted PV system is that it will only cost about $1,000 extra to get it installed if you get it at the same time as a new solar system. Yes, you will. But because of the diverter’s intelligent controller, which scavenges spare solar energy whenever it is available, you only need 1.5–2 kW of extra panels. And the good news is this: if you’re buying a 5 kW system (one of the standard sizes sold), you can usually get an extra 1.6 kW of panels for next to nothing. Sounds too good to be true? It really is true. And it’s due to the way the rebate works. The rebate is based on the number of solar panels. At the time of writing, the rebate is worth more than the cost of the panels. Combine that with the fact that you can add panels above the kW rating of your inverter (see Step 5 for details) and you can usually upgrade from 5 kW to 6.6 kW for around $1,000. When buying a new system, adding extra panels is cheap, so go big. The combination of the solar rebate and the inverter oversizing rules can make diverted PV the cheapest upfront option for heating your hot water with solar. If you already have a conventional resistive hot water cylinder, it may only add about $1,000 to the price of your system. If you need to buy a cylinder too, budget another $1,000 to have a conventional hot water cylinder installed (I would get a dual-element cylinder – it will be slightly more efficient than a single element). Combine the low price with the fact that there are no moving parts, and it’s also the most reliable solar hot-water system you can buy. There are some situations where diverted PV is either not a good choice or not possible. You have a small roof. If you have small roof and large household energy consumption then you should not use that valuable roof space to add PV for resistive water heating. You may have a large enough roof but want to reserve space for more solar PV panels in case you get batteries or an electric car in the future. In just a few years, I believe almost everyone will have batteries in their home and most people will be driving electric cars. These stationary and mobile batteries will require more solar PV panels to charge them affordably. Diverted PV is not as space-efficient as solar thermal hot water (which has a much smaller total panel area) or solar heat pumps (which take up no roof space). If your roof space is limited, diverted PV is probably not for you. Local network rules. Your local electricity network (your distributed network service provider, or DNSP) might have silly local rules that limit either the size of your solar PV panel array or the size of your inverter – or both. If there are local rules that limit the size of your solar power system so much that you can’t get all the solar PV you need, you should look at solar thermal hot water or a heat pump, as these are outside any network connection rules. _____ Leave it alone – I’m happy with the condition, reliability, fuel, environmental impact and running costs of my hot water system. I’ll just be getting quotes for solar electricity and won’t ? ?touch the hot water. _____ I’ll get diverted PV including a new cylinder added to my solar system, and I want to rip out my gas hot water system (I plan to get off gas completely at some point). 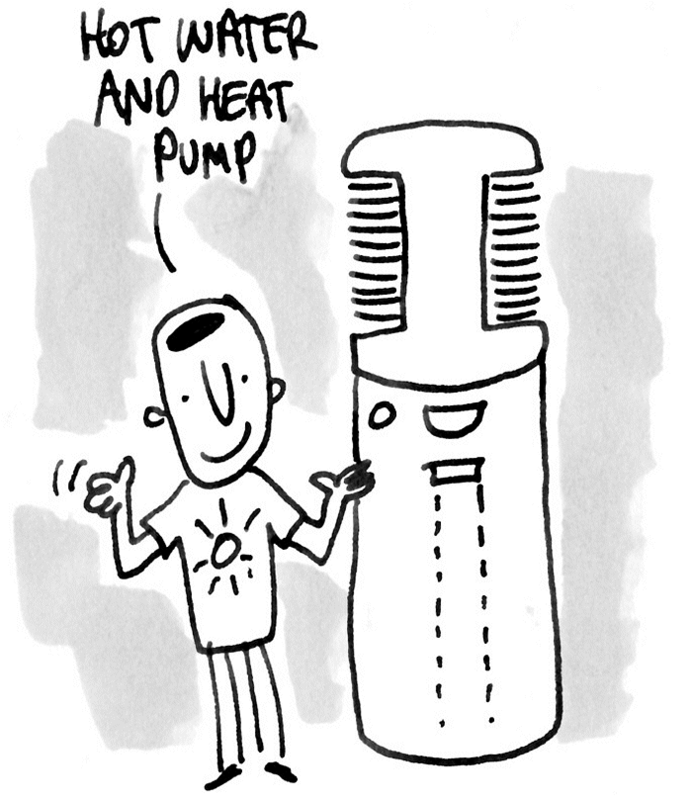 _____ I’ll get diverted PV with my solar system, and I can reuse my existing electric hot water cylinder. _____ I’m going to get quotes for a heat pump and get the installer to configure it to run in the daytime – predominantly off ? ?solar PV. _____ I don’t mind splashing the cash, I don’t want a heat-pump, and I don’t want to use my PV for water heating. I’m getting old-school solar thermal hot water. When you get quotes for solar power, refer back to your choice so you can brief the installers about the hot water system you want. LPG-fuelled hot water is a very expensive way to heat water. Seriously consider replacing or boosting it with diverted PV solar hot water or a heat pump. If you currently have mains-gas-fuelled hot water, estimate how much you’re paying for gas to heat your hot water. If reducing this cost by 70% to 80% is worth it to you, I recommend starting your transition to an all-electric home. Rip it out and replace with a heat pump or diverted PV. If you have conventional electric hot water, estimate how much you’re paying for electricity to heat your hot water. If reducing this by 70% to 80% is worth it to you then get either diverted PV or a heat pump. If your electric cylinder can be re-used then diverted PV should be cheaper to buy, unless you are in Victoria where there are extra rebates for heat pumps. If you have an electric heat pump and you’re happy with it, don’t touch your hot water system but get at least 6.6 kW of PV so the heat pump will have plenty of power to run in winter. If roof space is tight relative to the amount of solar PV you want to install now (or in the future) then go for a heat pump instead of diverted PV in the above scenarios. If you discover that your local electricity network won’t let you connect a PV system as big as you need for your regular daytime loads, consider solar thermal hot water or a heat pump, as they use the least electricity. FOOTNOTE: 6PV stands for ‘photovoltaic’ and is simply a fancy name for electricity generated directly from solar panels.